I Find It Inspections offers a complete inspection of your home or businesses where we look for mold related issues and use a variety of tools and pumps to investigate each location. All of the information collected allows us to create a comprehensive report where we let you know if there is a problem or not, where the sources are, and what needs to be done to fix everything. 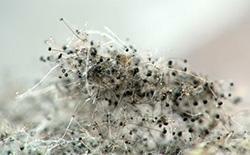 We offer a full inspection for any possible mold growth. We will check the exterior for areas of water entry and then work our way inside to see if it a drainage problem or an active leak inside. Site specific inspction are also availible if you have an idea where the water is coming in and you would like use to use our state of the art tools and equipment to verify if it is an active problem. All air and surface samples collected from the inspection site will be submitted to a local independent laboratory for analysis. The laboratory can then create a report with data from each sample that will include information on what, if any, types of mold are present in the air and how much there is. Also, where there is visible old growth, surface samples are taken. This is done because not all mold is easily airborne and it will also help confirm the source of air quality problems. Air samples are usually taken from at least 2 separate areas of the home or business in order to see how far a problem has spread if one is present. These reports can be used as evidence for tenants trying to get landlords to take action when there is an air quality problem. Our inspection can help solve disputes and influence building owners to address a problem. In the event of litigation you can show indisputable evidence and have a certified mold inspector on your side to testify. Contact us to book your mold or air quality inspection.